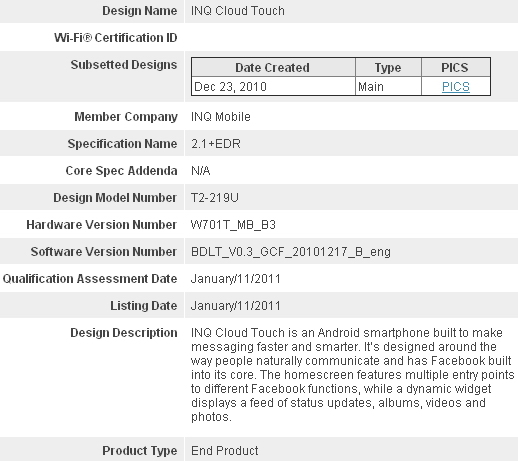 The INQ Cloud Touch is the new Facebook phone? According to a filing with Bluetooth SIG that’s exactly what the current name is being referenced as. INQ Mobile has been the manufacturer of the phone since this thing was first rumored, so this doesn’t come as a complete surprise, well except for the fact that Zuckerberg denied that they were working on one. Or are they working on two? Maybe a QWERTY version and an all-touch screen version? And yep, it’ll be Android-based. …is an Android smartphone built to make messaging faster and smarter. It’s designed around the way people naturally communicate and has Facebook built into its core. The homescreen features multiple entry points to different Facebook functions, while a dynamic widget displays a feed of status updates, albums, videos and photos. Sounds like a lot of Facebook, but INQ is also known as being a social guru, so maybe they are just overdoing their description a little? Next Version of Android Dubbed "Ice Cream Sandwich"